Brendan Donaghy is currently enrolled at Lock Haven University with the intention of obtaining a B.S. in Biology. After graduation, he has plans to pursue a graduate degree in aquatic biology. 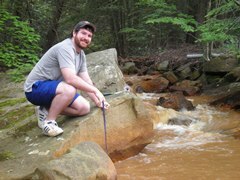 His work in the field includes the Pennsylvania Fish and Boat Commission's Unassessed Water Initiative as well as providing research utilizing morphometric analysis on native eastern brook trout populations. Brendan's internship is sponsored by Trout Unlimited. Kathleen LaForce is a rising senior at Juniata College working towards a B.S. in Wildlife Conservation. 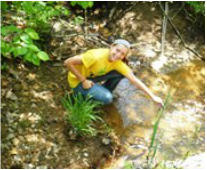 Her field work and internships have involved benthic macroinvertebrate surveys, LIBS tissue analysis on eastern coyotes, and population surveys of birds, freshwater fish, reptiles and marine invertebrates in the United States and Ireland. In her free time, she enjoys fishing, hiking, and painting. Her goal is to pursue a masters in Zoology at University College Cork in Ireland. Kathleen's internship is sponsored by Trout Unlimited. Lauren McGarvey is currently a junior at Grove City College studying biology. Her previous experience includes volunteer work with Trout Unlimited. She has also been part of the research team at Grove City College sequencing DNA from brook trout samples provided by Trout Unlimited. Next semester she will be heading an additional research project involving brook trout DNA. After undergraduate study, she plans to pursue further study in aquatic biology. Lauren's internship is sponsored by Trout Unlimited.